WeWork institutionalized the idea of work places with amenities. It was a playbook started, or at least accelerated, by high-tech companies, like Google, whose headquarters transformed into entertainment centers -- think bean bags, scooters, onsite gyms, massage therapists, and vegan lunches. Now HqO is hoping to do the same for all buildings. HqO is a play on headquarters and H20, meaning make your headquarters come to life. 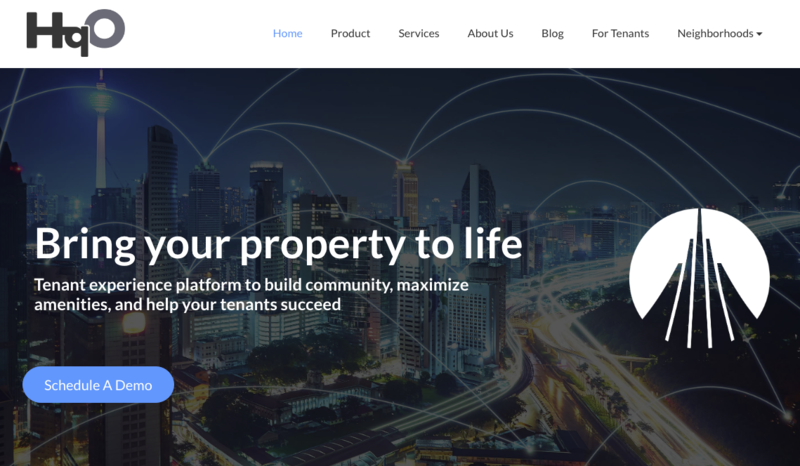 The Boston-based startup announced Thursday that it raised $6.6 million in a series Seed round, led by Accomplice, with participation from a number of real estate-focused venture funds, from JLL Spark, a division of JLL, with a $100 million fund, Navitas Capital, a venture firm whose LP base consists of largely landlords, DivcoWest, an owner, operator, developer and real estate company, Pritzker Group Venture Capital, and Goodwin Gaw. "What we're building is 'tenant-experience software," said Chase Garbarino, co-founder and CEO of HqO, whom I believe coined this new category. "There is a trend underway as more people enter the knowledge-base economy and that is increasing competition for talent. So companies are putting more emphasis on talent-retention, and that includes creating great places to work." Landlords are now responding and seeking software to help them automate their buildings in a variety of ways, Chase said, adding that they fear disintermediation, much like taxi cab operators or hotel operators are feeling from companies, such as Uber and Airbnb, respectively. Some of the offerings HqO is helping landlords to provide their tenants include being able to use a smartphone as the gateway to a number of services, such as booking a conference room, booking a fitness class from a gym located in the building, replacing an RFID card to get into the building, or getting alerts about transportation, such as shuttles to and from the property. The app can even be connected to retailers in the building, and retailers can push out promotions to the tenants. For example, Reebok is a tenant of one of HqO's building clients. Reebok uses the app to share CrossFit and nutrition classes with other tenants. If the landlord chooses to brand itself, it can have a white-label mobile app that tenants can download and use to interact with the facilities in the building. Or landlords can opt to allow tenants to download the HqO app, from where tenants can then find their buildings. For landlords this does give them a competitive advantage over other buildings that don't have the amenities, but it also gives them a treasure trove of new anonymized information about its tenants. About half of HqO's clients select the white-label product, said Chase. So how long does it take to set up a building? Chase said to set up the app, it takes about two weeks. Then there's another 2-4 weeks to launch, and Chris' team also works with the landlords to ensure they have the right marketing program in place to get tenants to sign up and enjoy the perks of connectivity. HqO charges landlords 5 cents per square foot annually for its service, which doesn't include the set-up fee. The company has eight clients today, mainly in the Boston and DC area. It projects to have 30 by Q1 2019. HqO is a tenant experience platform that enables landlords to create places people love. Headquartered in Boston, HqO partners with the leading landlords, property managers, and brokers who want to attract innovative tenants, provide a premium experience, and increase overall asset value. For more information, visit https://www.HqO.co or follow HqO on Twitter @HqOapp.